Brenda Harris has joined the Oldcastle APG management team with direct line responsibility to grow masonry cladding market share. With more than 30 years in hardscape and masonry markets, she will take a leadership role with several new product lines, such as the Echelon Masonry Veneers’ new Be.On Stone, a mechanically fastened (anchored) product proven to enhance a building’s moisture deflection properties; improve labor efficiencies; reduce jobsite waste; and, equal to installation in virtually any adverse climate. Harris began her career at Stewart Building & Roofing Material in Tucson, Ariz., proceeding to southern California, where she spent a decade at Orco Block and 11-plus years leading Headwaters Stone Division sales. Separately, Echelon Masonry garnered recognition in three architectural/engineering/construction publications’ year-end features. The InsulTech Concrete Masonry Systems (shown here) landed an Architectural Record Best Product Award for 2016, published in the December issue and judged by a panel of architects and specifiers weighing innovation, functionality and aesthetics. InsulTech also ranked number 20 in Building Design & Construction’s “Top 101 Products,” a December report based on reader inquiries and editor input. Echelon Masonry was also named in Architectural Products’ Top 50 Readers Choice awards for the Artisan Collection’s Westpeak Lightweight Veneers. InsulTech can meet and often exceed code while offering multiple design options, with thermal efficiency, continuous insulation, moisture management, and exterior and interior aesthetics. It features a structural concrete masonry unit, molded insulation insert and—on the exterior—a lightweight stone veneer finish. Westpeak is a unique lightweight veneer from Echelon’s Artisan Collection, featured in Onyx, Wheat and Magnolia colors. Westpeak Lightweight Veneer’s stone aggregate complements virtually any interior or exterior application due to its tight dimensional tolerance. Coralville, Iowa precaster Zero Energy Systems has appointed Donn Thompson, AIA, LEED AP BD+C, as vice president, Business Development & Communications, tasked with expanding market share for the company’s high performance, edge-to-edge insulated, structural concrete wall panel systems. Thompson has been active in the industry for nearly 20 years, with extensive sales support and field experience on a variety of concrete systems. Most recently, he was Portland Cement Association senior director, Market Development, responsible for coordinating target market, concrete product, and cement-based building system promotion strategies. Prior to PCA, he served as Reward Wall Systems commercial project manager and Owens Corning business development manager. New Enterprise Stone & Lime Co. has acquired the assets of eastern Pennsylvania operators Berks Products Corp., Reading, and EJB Paving & Materials, West Lawn in transactions totaling $46.3 million. Berks’ four ready mixed and two aggregate plants plus a construction supply center, and two EJB asphalt plants, serve markets west and north of Philadelphia. They are situated between New Enterprise’s existing stone, aggregate, ready mixed and asphalt production sites from Lehigh Valley to Lancaster, Pa., and expand its operating footprint into the Reading market. 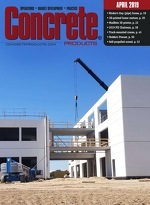 Connecticut-based self-leveling material specialist Laticrete International has announced a turnkey service, Supercap Ready-Mix Delivery, affording end users the benefits of the company’s pump truck technology plus the option of material delivered in bulk. The Supercap Ready-Mix Service delivers premium cementitious self-leveling underlayment directly to a jobsite, wet out of the hose. Among company-cited benefits: Convenient service, consistent quality, increased jobsite safety, and OSHA silica dust compliance. With the service launch, he adds, there are now three ways to access the Laticrete Supercap system: order materials delivery by the project and lease a truck or buy the truck. With the ability to pour up to 50,000 square feet in one day and deliver material up to 50 stories high, the system has been proven in more than 100 million square feet of installed underlayment across North America.